But in 30 to 40 percent of cancer patients, these drugs can cause enduring pain in the hands and feet, says Dr. Windebank. Peripheral neuropathy significantly changes patients’ quality of life. Some interpret the pins and needles of nerve damage as pain. For other, it’s numbness. When it affects feet, the nerve damage can affect balance and gait. But it’s not clear who is most at risk from this side effect. Researchers in Dr. Windebank’s lab are trying to find out and discover if there are ways to protect nerve cells prior to chemotherapy. 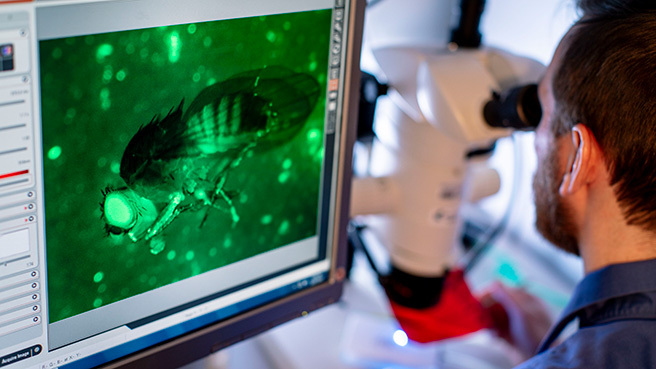 And for the first time in science, they’re doing it using fruit flies. Read the rest of the article on Discovery's Edge.